The red roots of the madder plant (Rubia tinctorum, or "dyer's red") contain 1-2% of the colourant alizarin, which in pure form gives rise to red-orange crystals. These dissolve in water with difficulty, but can be dissolved in alcohol with no problem. Alizarin belongs to the family of anthrachinon dyes, distinguished by having three linked benzol rings. Along with indigo, madder is one of the oldest plant dyes. Traces of the red colourant alizarin were found on a belt in the tomb of the Egyptian Pharaoh Tutankhamen (ca. 1337 BC). 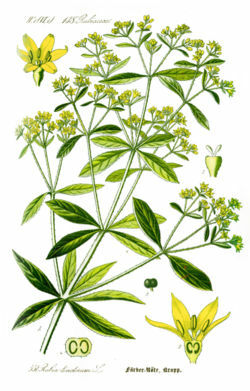 Written records about the use of madder have come down to us from Greek and Roman authors. Pliny the Elder, a Roman writer and officer, writes around 23 BC of a plant by the name of rubia, which is "indispensable for the dyeing of wool and leather" and highly profitable. The Romans used the red dye as a substitute for the much more expensive purple which was obtained from the murex. In Central Europe we find the first indications of the use of madder in the 5th century AD. In the 15th century the main centre for cultivation of the plant was the Netherlands. Trade in red-dyed textiles and leathers developed to cover the whole of Europe. Special prestige attached to cordwain leather from Cordoba. Even the Vikings dyed their textiles with madder. Turkey, however, was the origin of a dyeing technique that achieved widespread fame. A new and complicated method of dyeing resulted in a fiery red that was exceptionally colour-fast - this was the colour that came to be known as "Turkish red". Turkish immigrants aired the secret of the technique in France in the 17th century, and madder cultivation in Alsace and Provence entered on a new florescence. Up to the 19th century, 70,000 tons of madder a year were being used for dyeing (the figure dates from 1868). In Germany the plant was cultivated in Baden, in Württemberg, in the Pfalz and in Mecklenburg, as well as in Silesia and Austria. From 1871 onwards madder production fell upon hard times. In 1869 the German chemists Graebe and Liebermann succeeded for the first time in producing synthetic alizarin. The synthetic dye was a good deal cheaper than the natural one. As a result, it no longer made sense for farmers to go on cultivating madder. Today there are just a few pockets of cultivation remaining in Turkey and the south of France.